We're thrilled that our new neighbor, the National Museum of African American History and Culture, will open its doors in September. To celebrate, we're opening a small display of photos in our Lower Level gallery bringing together photographs from two of the museum's Archives Center collections. 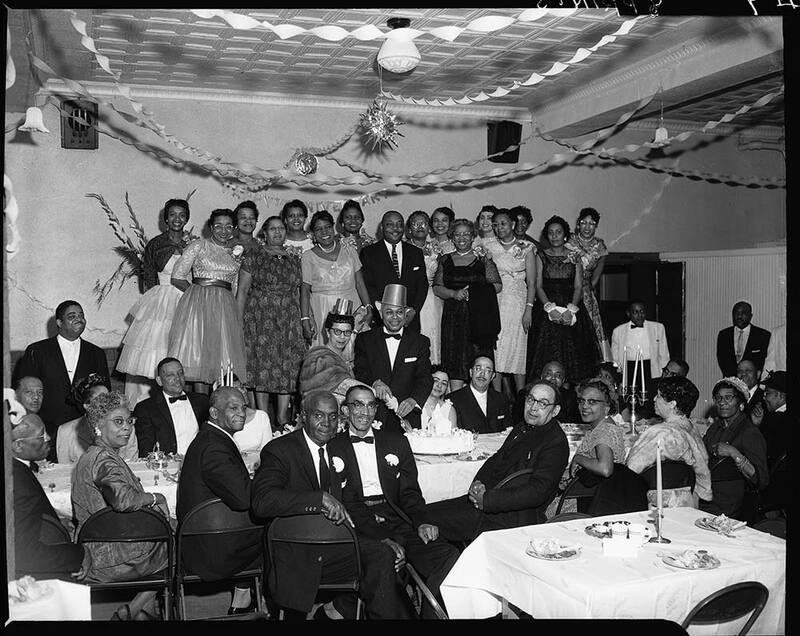 We're gathering a variety of images that celebrate events, occasions, and moments from everyday life in African American communities. But we don't want to party alone. Join our team to select which photos go up on our walls by voting for one from each of the pairs below. In any museum team, different voices from the museum staff may advocate for the inclusion of different objects or documents. Now that you, dear reader, are honorary members of our Celebrating Our Memories, Celebrating Our Lives: Snapshots of African American Communities team, we thought we'd let you in on the debate. Below, staff members share their thoughts on each of the photos. Then it's your turn to pick which of each pair would be the best to display, based on your own perspective and the photo's merits in representing the theme of celebration. If you like, you can add your comments explaining why you think one photo is better (or how it may highlight a connection to your own experience). We may use your contributions in the development of the display. If we use a comment in the text of the show, we'll ask your permission and credit you appropriately. "Oh, no! Someone left this at Fournet Drugstore in St. Martinville, Louisiana, failing to pick it up before the store closed! Apparently, this charming wedding portrait of the bridal party in their bubble-gum colored dresses never got picked up and this happy couple have sat in the processing envelope until now. "Well, not everyone is happy, though. Check out the young woman on the left by the cars with those arms crossed, purse at her elbow, and that chin tucked in! I love the shape and colors of the bridesmaids' dresses. In a time when color photography was not yet widely available, adding color by hand was a way to bring the moment to life. 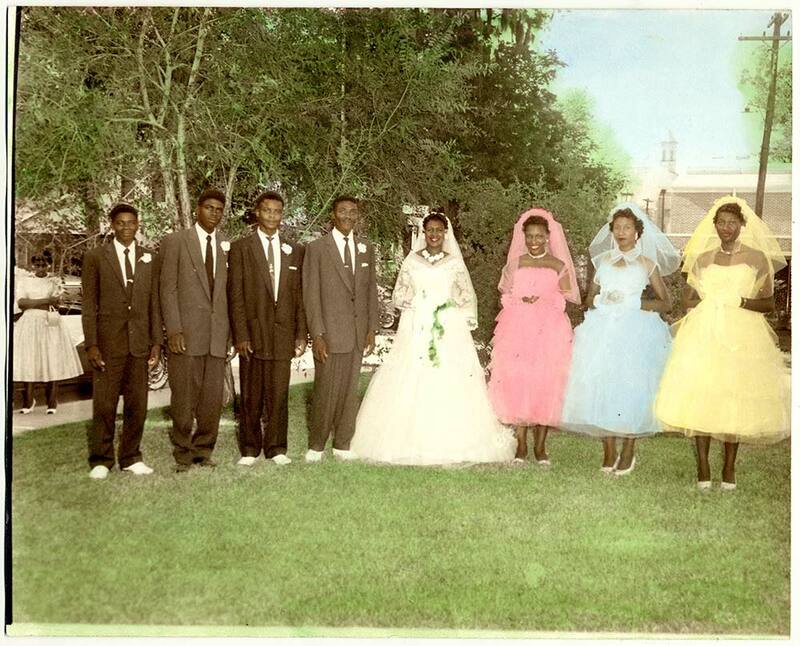 In this particular photograph, the sky, trees, and grass are also colored, letting everything else fade a bit into the background to emphasize the bridal party. For me, however, it has the effect of placing the people in a kind of time warp, like in The Wizard of Oz or the movie Pleasantville where monochrome is in one world and the color in another. Maybe that's kind of how people feel on their wedding day! Do you suppose there is someone who will recognize this group?" "We don't know who these people are, but we can tell that they are part of a very high-style wedding. Everyone who has watched the BBC drama Downton Abbey will recognize the bridesmaids' dresses in this photograph as being at the height of fashion for the mid-1920s. Each of the pastel taffeta clad young women wears a robe de style, with side hoops (or panniers) reminiscent of 18th-century French court dress. 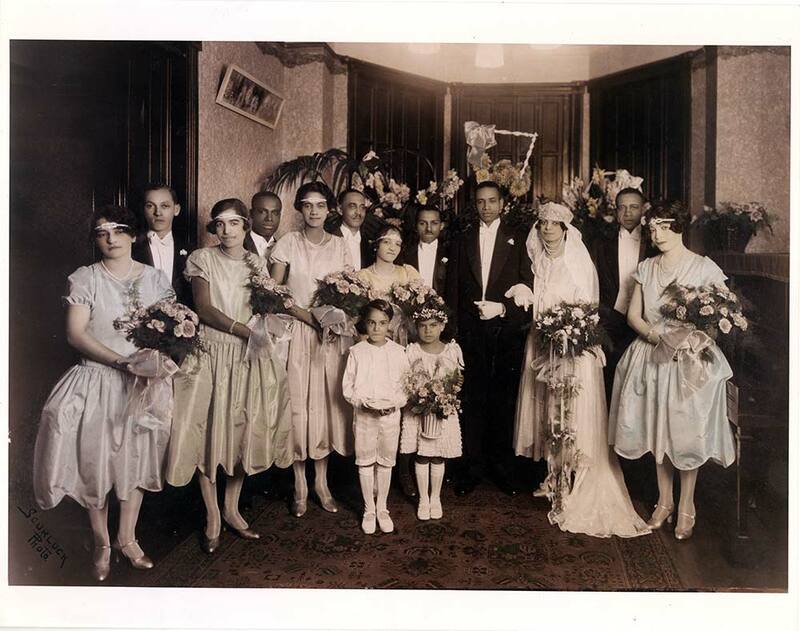 Their silk taffeta dresses, gleaming shoes, silk stockings (sheer stockings had not yet been invented), and the silk ribbons that bedeck the bouquets all testify to the bride's taste and fashion sense—and probably her father's deep pockets. The bride herself wears a dress and veil of lace with a very popular 'Russian' style pearl headdress. "The men are immaculate in formal evening clothes—white tie, stiff white shirt with a wing collar, white waistcoat, and white gloves, with black tailcoat, trousers, and shoes. Even the ring bearer and the flower girl are dressed in the approved fashion for a society wedding. The woman on the bride's right (actually the bride's left, but the right of the photo) is probably the maid, or matron, of honor. Her three-strand pearl necklace and the ruching detail on her dress below the hoops set her apart from the others. The cording details on the dresses and the beautifully draped skirts with their scalloped hems reveal that these are not ready made dresses from a store—a very skilled and talented dressmaker was at work here. I wish we knew her name. "In addition to the rich details in the attire in this photo, I see something else. This photo encourages the viewer to look beyond the stereotypes and recognize the existence of a free African American middle class—a class that existed in the 19th century and worked very hard for emancipation." "This 1962 photo captured a moment in life and can open the door to so many stories. As the director of our Food History programs at the museum and a wedding cake baker in my spare time, the first thing that stood out to me is the cake. The flowers, the tiers, and the decorative swans had me asking so many questions. Who made it? Did Mamie and Addison pick the design themselves? Do those pre-cut slices of cake already on the table mean that cake isn't even real? "The photo itself can't answer those questions for me, but it reveals a moment in the life of the man who chronicled African American lives in Washington, D.C., in the 20th century. Addison Scurlock opened the Scurlock Studios on U Street NW in Washington, D.C., in 1911. From personal family photos to images of visiting dignitaries and performances, historians say that there was always a Scurlock camera at every event in D.C.
"This photograph was taken one year before Scurlock sold the business to his sons. To see the man who helped capture memories for so many people in a photograph that captures a memory of his own is very special. Photography reminds us of our personal and collective memories, while inviting us to ask questions about the past. And it can inspire us to eat cake, too!" "Where are the kids? 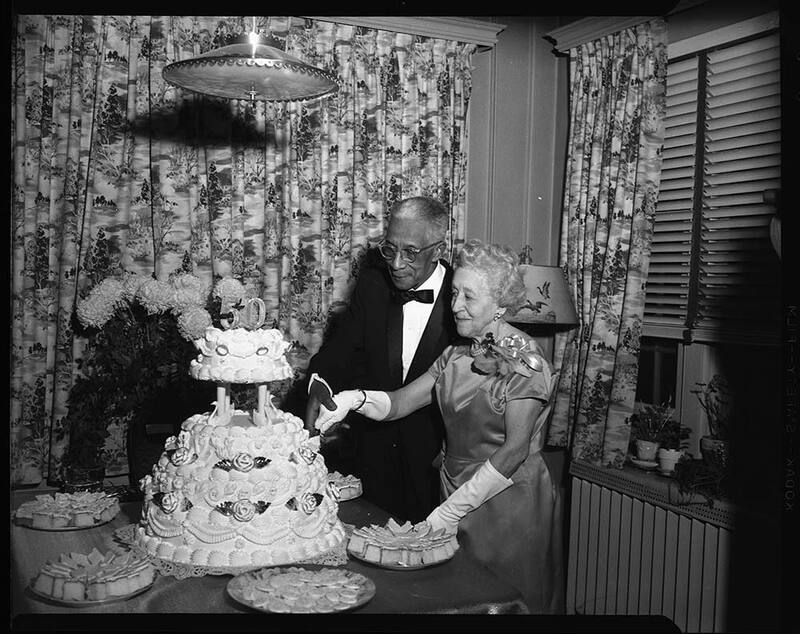 My first reflection about this photo of a gala wedding anniversary sprang from my own memories of a similar celebration I attended as a child in Detroit, Michigan. My grandparents' 50th anniversary festivity took place also in a room at a church, the Motor City's historic Second Baptist Church, which was organized in 1836 by former slaves who experienced discrimination at the city's First Baptist Church. Second Baptist had the distinction of having been involved in the abolition movement and it was rumored that escaped slaves were harbored there. "When the anniversary party got boring, with the elegantly festooned adults posing for photos like this one, my young cousins and I took off to attempt to fine the rooms where the escaping bondsmen hid. We only succeeded in finding the first elevator I'd ever encountered that didn't have an operator, as I'd only been in elevators in Detroit's J. L. Hudson department store with its elegant 1930s elevators and stylish and sophisticated operators. A deacon was none too happy to find kids running around the stately church. Perhaps the folks in this photo did the smarter thing and left kids at home!" "Like so many historical artifacts, this photograph offers us a tantalizing glimpse into the past. The only documentation we have for the photo is from a note written by someone at the Scurlock photography studio, 'Christening of Deane baby…Mar. 1949'—so little information for such an important event in a young family's life. We can glean some information from the image. Certainly family, godparents, and friends dressed up for this special occasion, but even so their elegant clothing projects that they're comfortably well-off, as does the fact that they hired a professional photographer to capture the christening. 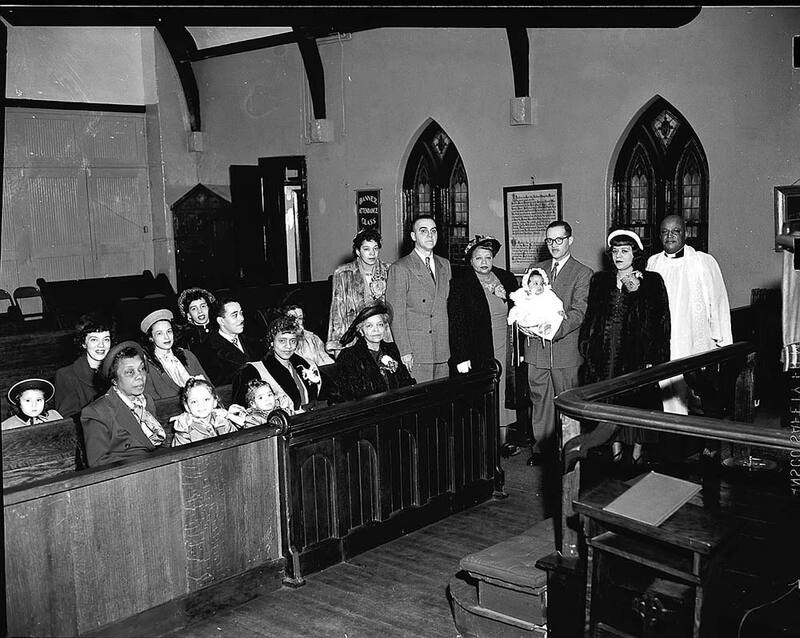 "The young parents apparently belong to an older Protestant church (the Gothic revival pointed arch and stained glass windows are the only decorations on the otherwise plain and icon-free walls) led by an African American minister; the congregants are multi-generational; and the baby wears a traditional white christening gown—all of which suggest that they have chosen to participate in a black church and maintain family, community, and religious ties and traditions. "Baby Deane would be 67 years old now. We know what's happened in the larger world during that lifetime but what was this child's life like? Does the christened baby still belong to this church as an adult? The photograph can only hint at what was, not what was to come." "I talk to many children here at the museum, and I know how hard it can be for them to sit still for long periods of time, whether it's during a museum program, a religious service, or a photo shoot. Despite the girl's apparent indifference, we can tell this day was important to her family and her community. 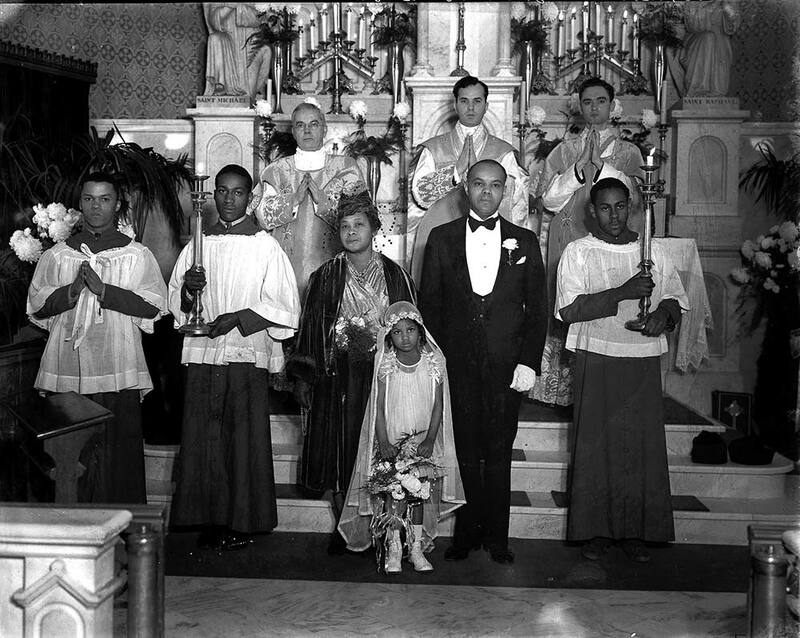 The family and clergy are all dressed very well, and fresh flowers decorate the church. The family even hired a professional studio to take a picture so that they could honor and remember the day for generations to come. My parents still have in their house a framed picture of me in my (non-puffy) First Communion dress. "Do you think this little girl or her children still have this photo framed on a wall somewhere as a reminder of their faith and family? Vote for this awesome little girl's sacrament photograph, taken by the Scurlock Studio of Washington, D.C.!" Voting closed on Friday, May 27. We'll announce the winners in June 2016. Note: Developing and designing exhibitions and displays is a complex process. We'll do our best to include every photo that wins your vote, within the limits of the laws of exhibition math and physics. If a photo doesn't fit on the wall, we promise to display it on our website instead. Thanks for understanding and being part of our team!